Delivered next day fully charged and ready to fit. Well packaged and with clear instructions on unpacking and preparing for fitting. Battery exactly as described and a perfect replacement for my old Stiga ride on mower. Second purchase from Tayna. Am very pleased again. Quality battery at attractive price. Excellent service and knowledgable staff topped off with quick delivery. Varta always seem to be top quality batteries, with decent plates. My last one lasted over 4 years. Unlike some other brands I've experienced, where the plates are crumpled on arrival, with no expectation of lasting any length of time..
excellent service, battery arrived on time filled it with acid supplied and charged for 2 hours, and bike started first time. Would recommend this company and service to anyone. Great online advice and swift delivery! 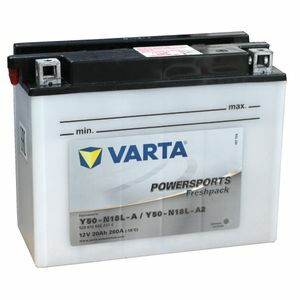 I have Varta Batterys, of different sizes, fitted to several machines. They are good quality. I have had good service from Tanya supplying me with their products over the years. Thank you Tanya. Product arrived on time and fits perfectly on my mower. Just what I expected. I preferred this new method of bottles with a pipe to fill the lead acid battery. Clean and safe. Very good A quick top up charge with the optima the and the battery fired up the XS11 very easily. Great product. Great delivery. Perfect.